The most famous sign in Greater Los Angeles is the Hollywood Sign, which was dedicated on July 13, 1923, as an advertisement that became a permanent fixture of the landscape. 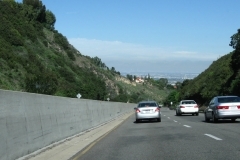 Located on Mount Lee (not Mount Hollywood), the Hollywood Sign is visible at several vantage points from Mulholland Drive. 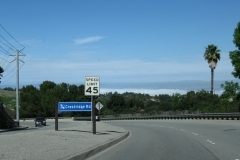 There are no public roads leading up to the sign itself. 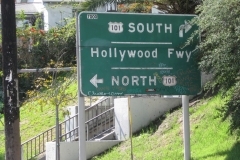 The property behind the sign (on Cahuenga Peak) was added to the city’s Griffith Park on December 9, 2010 to help preserve the unfettered view of the Hollywood Sign. 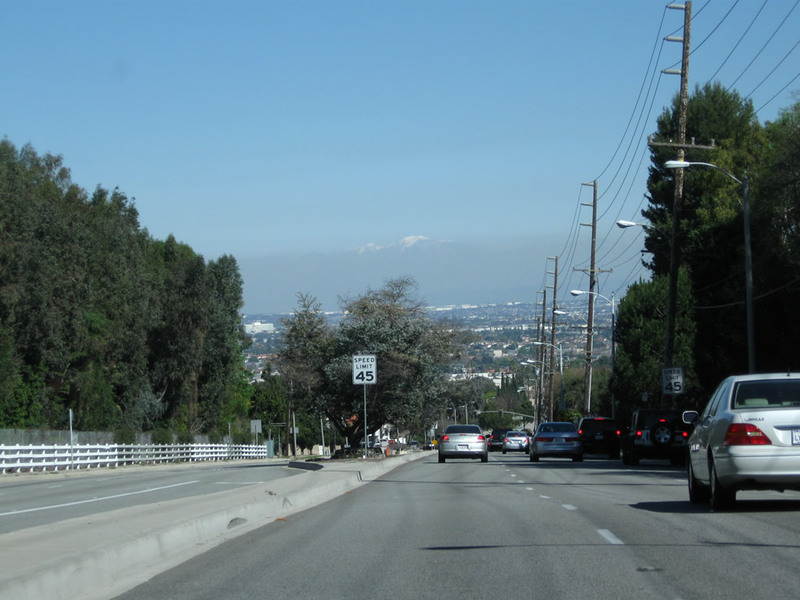 Photo taken 02/13/11. 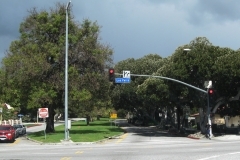 The city of Los Angeles modified its street blades to this design, which incorporates the street name, address block, and city seal. 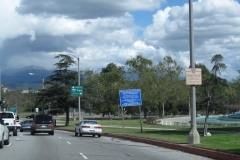 This example for Exposition Boulevard is posted at Figueroa Street (old U.S. 6 and California 11). Photo taken 05/05/12. 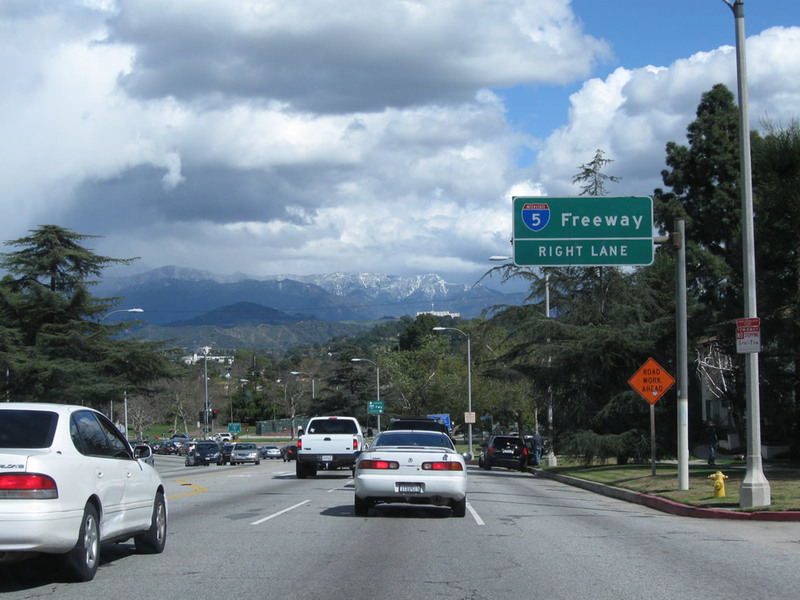 Several interesting roads and highways bisect the Los Angeles region. 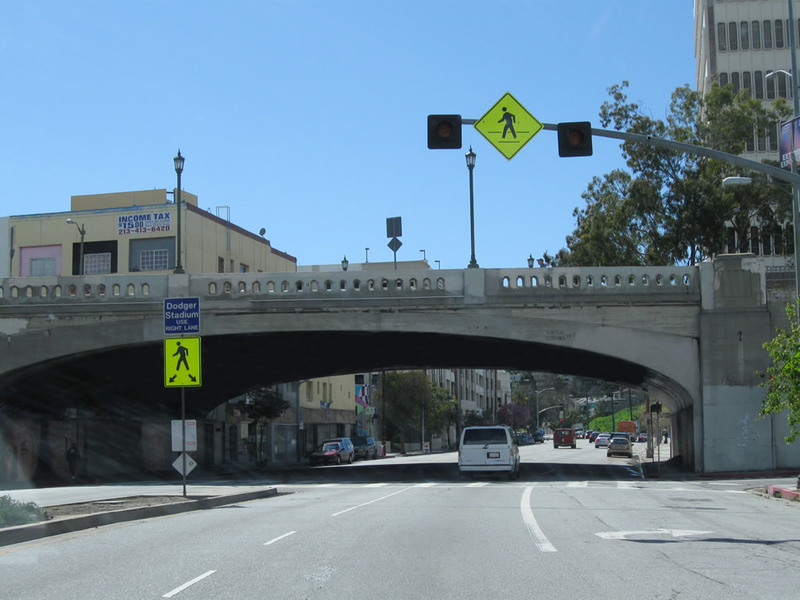 Photos below profile several of these roads, including unique bridges and vistas in the City of Angels and nearby environs. 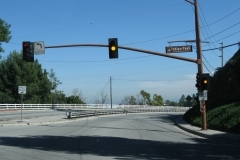 Northbound Crenshaw Boulevard meets San Clemente Drive and Valley View Road. 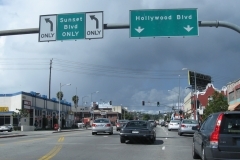 Crenshaw Boulevard will continue uphill to Crest Road. 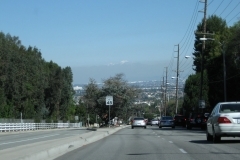 Photo taken 02/13/11. 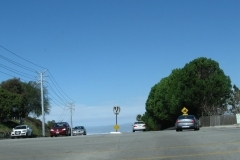 At the intersection with Crest Road, northbound Crenshaw Boulevard reaches its highest elevation on top of Rancho Palos Verdes. 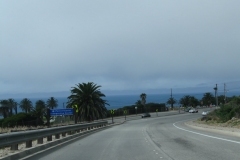 Photo taken 02/13/11. 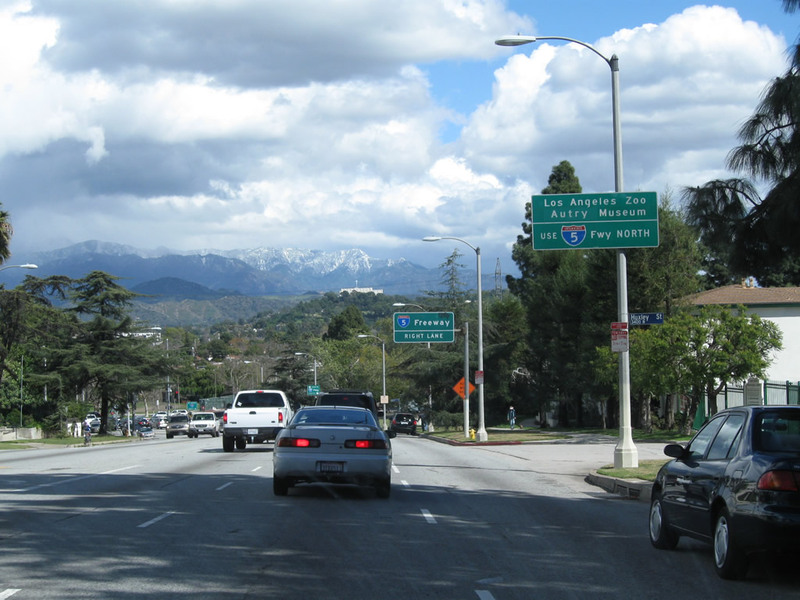 Crenshaw Boulevard descends from the top of Rancho Palos Verdes and proceeds northeast toward Rolling Hills, Rolling Hills Estates, Lomita, and Torrance. 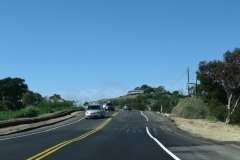 Photos taken 02/13/11. 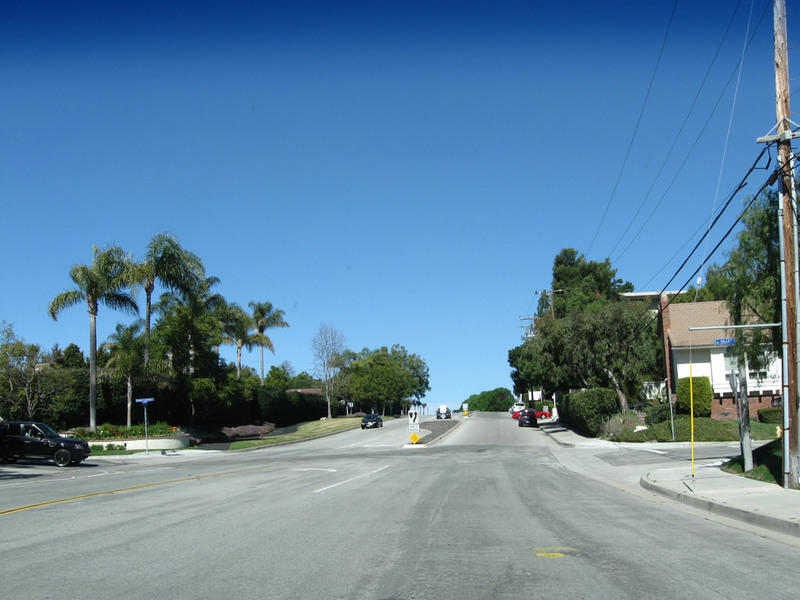 Northbound Crenshaw Boulevard meets Indian Peak Road in Rolling Hills Estates. 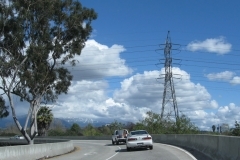 Photo taken 02/13/11. The roadway curves northeast and continues downhill. 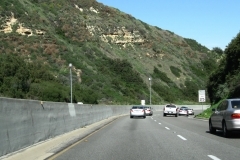 A concrete median barrier is placed between the two directions of traffic to prevent crossover accidents. 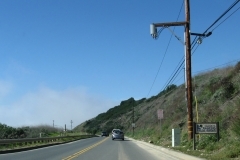 Photo taken 02/13/11. 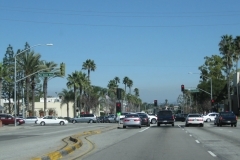 Crenshaw Boulevard north after Silver Spur Road. 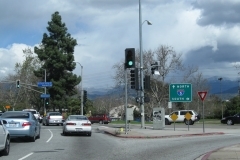 Photo taken 02/13/11. 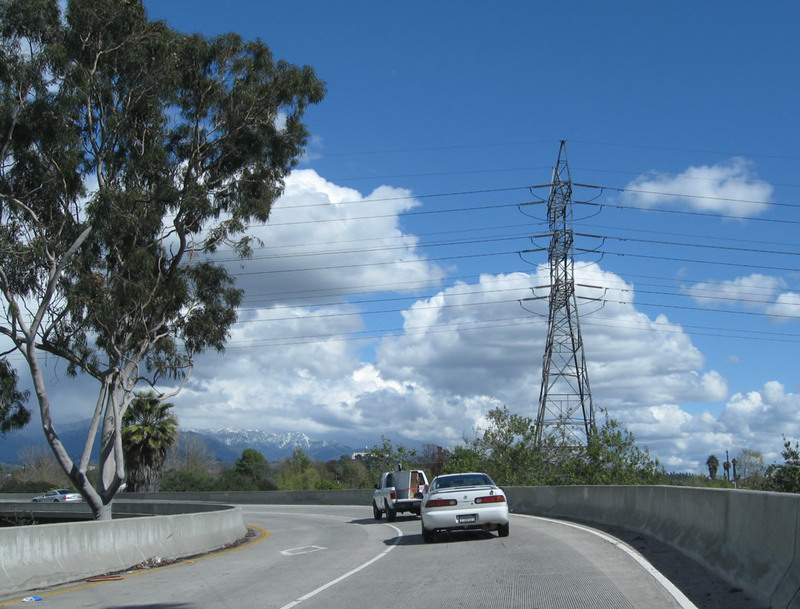 Occasional glimpses of the Los Angeles Basin can be had from Crenshaw Boulevard northbound. 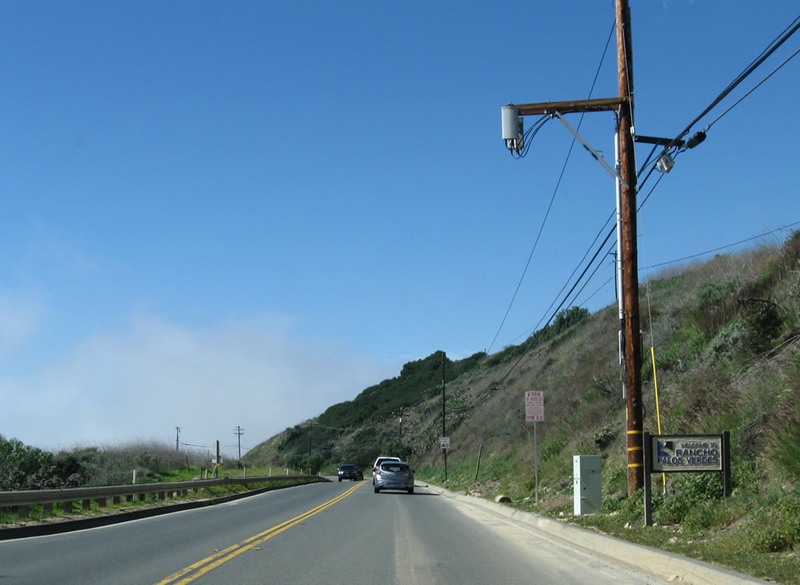 Photo taken 02/13/11. 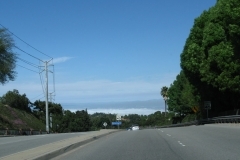 Northbound Crenshaw Boulevard approaches Palos Verdes Drive North, ahead on the right is the South Coast Botanic Garden. 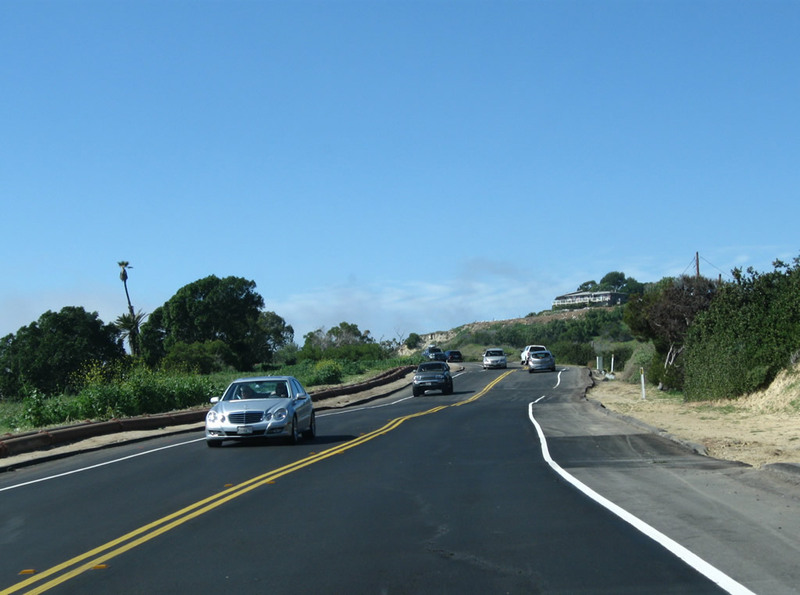 Photo taken 02/13/11. 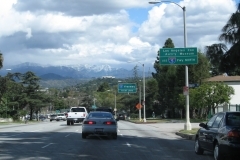 Snow capped peaks rise in the distance as Crenshaw Boulevard lowers from north slope of the hills. 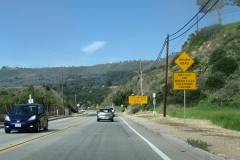 Photo taken 02/13/11. 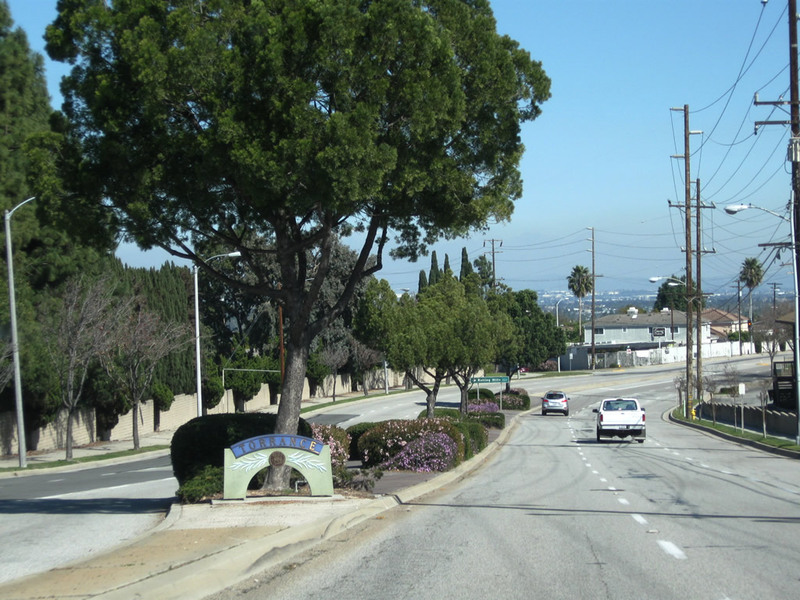 At the bottom of the hill, Crenshaw Boulevard enters the city of Torrance, "The City with a Hometown Feel". 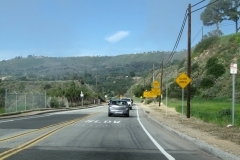 Photo taken 02/13/11. 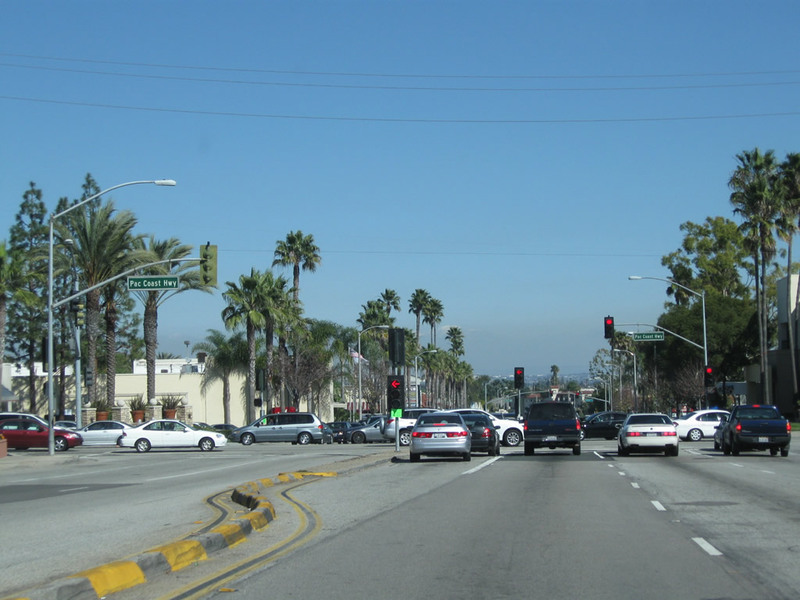 Northbound Crenshaw Boulevard approaches California 1 (Pacific Coast Highway). Photo taken 02/13/11. 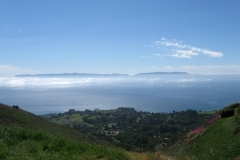 This view looks down from a trail connecting with the south end of Crenshaw Boulevard on Rancho Palos Verdes south toward the Pacific Ocean and Santa Catalina Island. 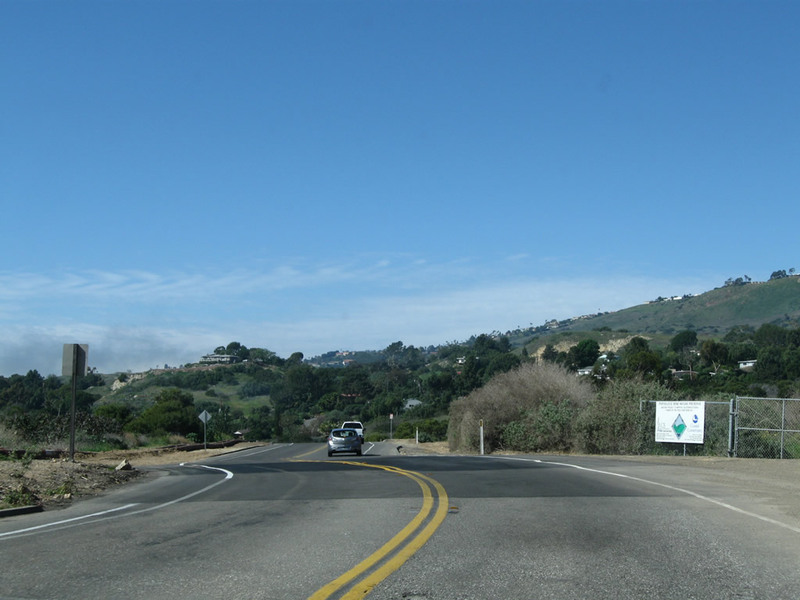 Photo taken 02/13/11. 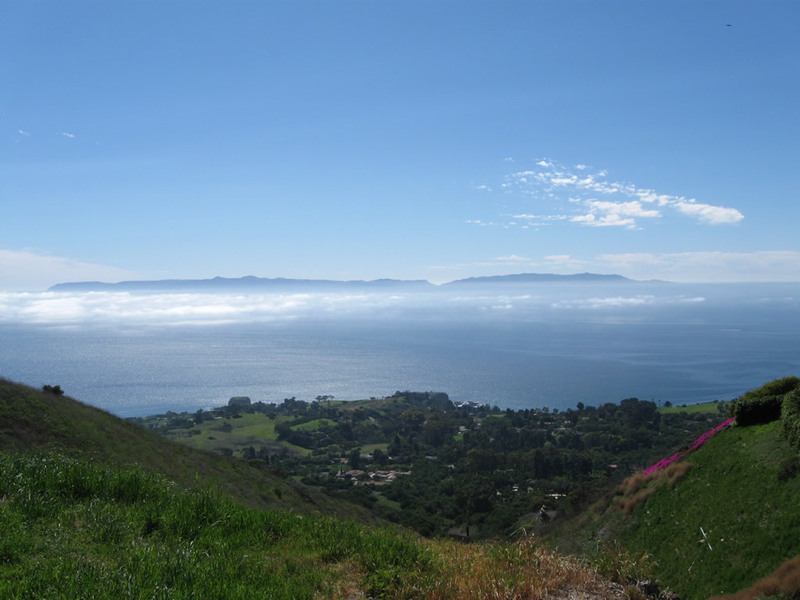 This view looks due west from the same vantage point on Rancho Palos Verdes. Photo taken 02/13/11. 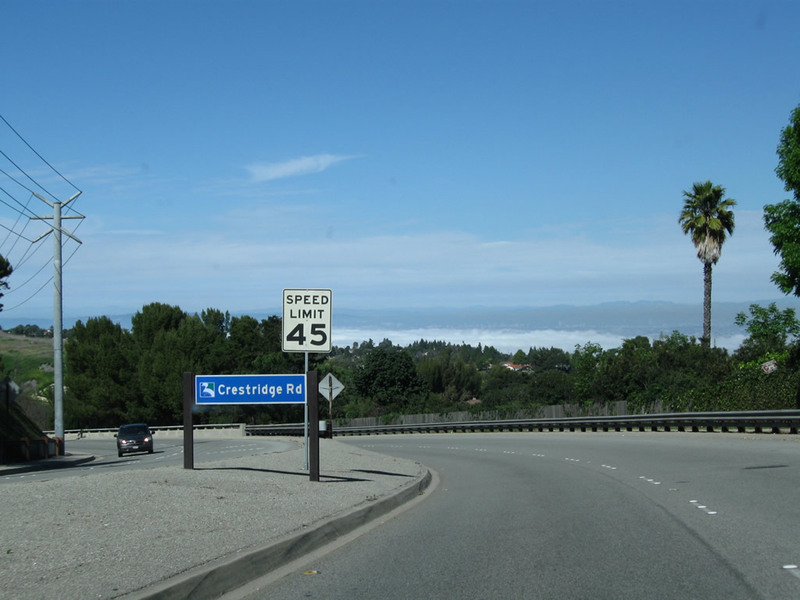 Looking east from the same vantage point toward Trump National Golf Course. 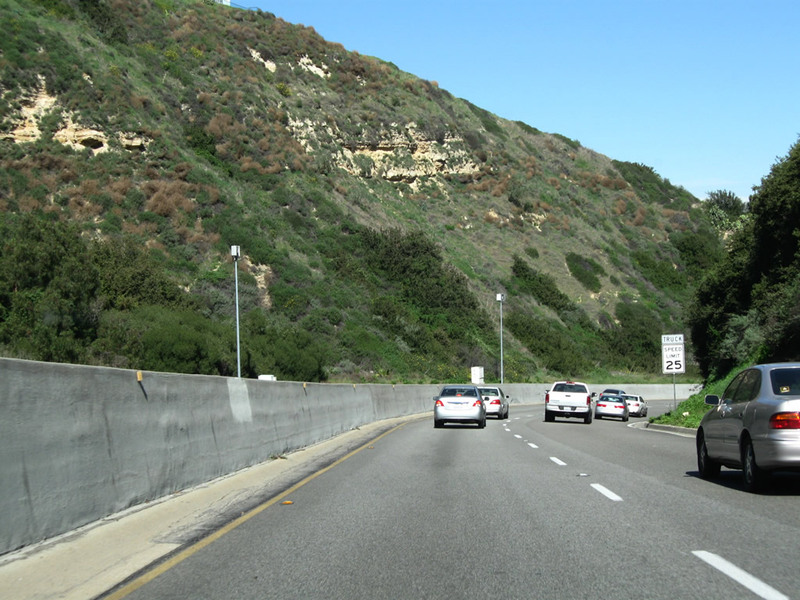 The open space below this point was originally intended to carry an extension of Crenshaw Boulevard south to Palos Verdes Drive South, but constant land motion has prevented any construction on this unstable bluff. 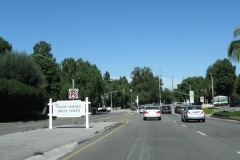 Photo taken 02/13/11. 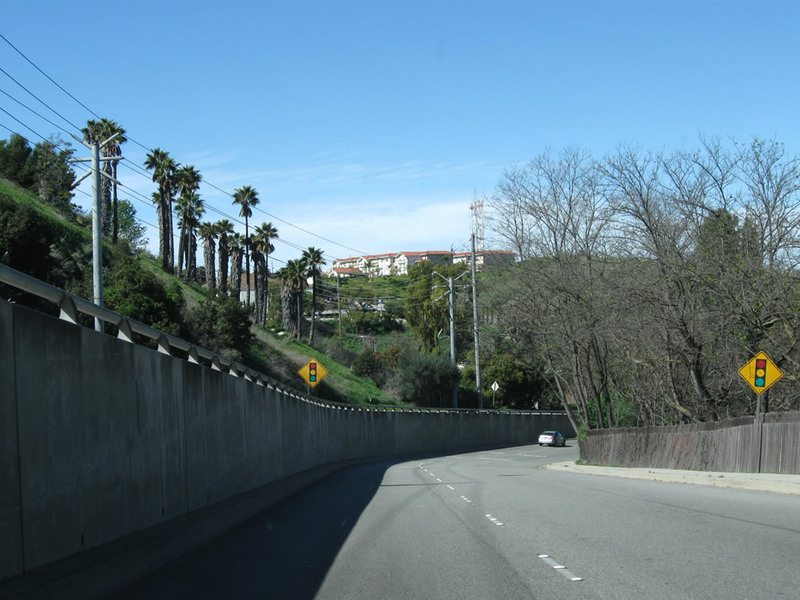 A steep hiking trail is all that remains of plans to extend Crenshaw Boulevard. 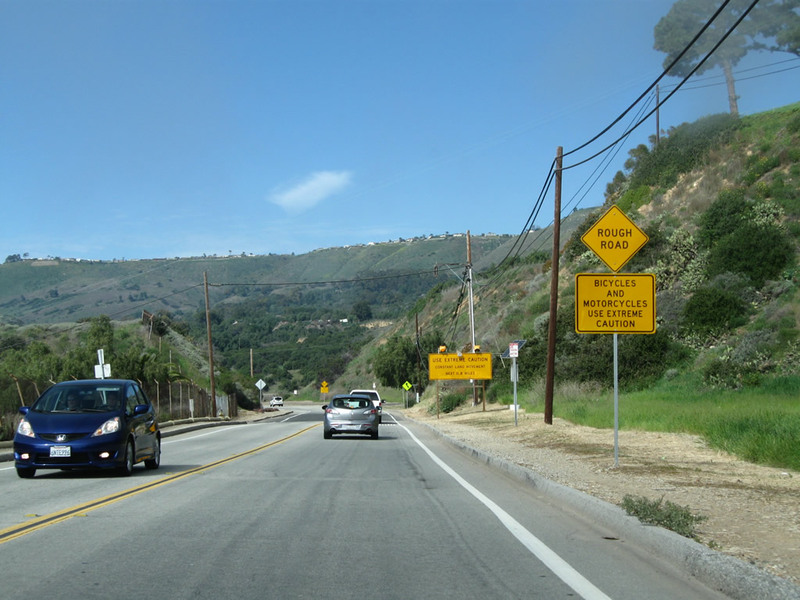 Photo taken 02/13/11. 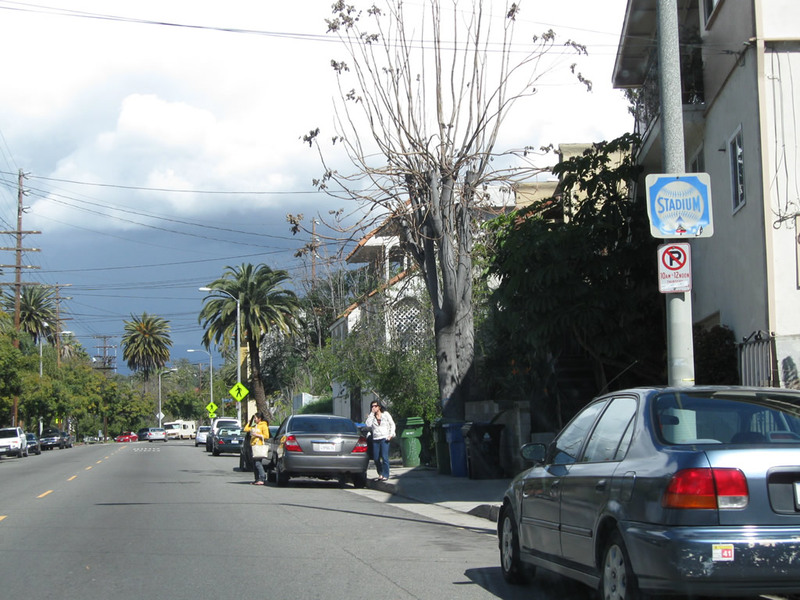 Echo Park, which includes Echo Lake, is bounded by Glendale Boulevard on the west side and Echo Park Avenue on the east sid. 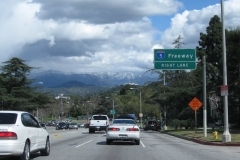 Traveling northbound, the lake is on the west (left side) of the road, and a trailblazer is posted for Dodgers Stadium, which is located in Echo Park. 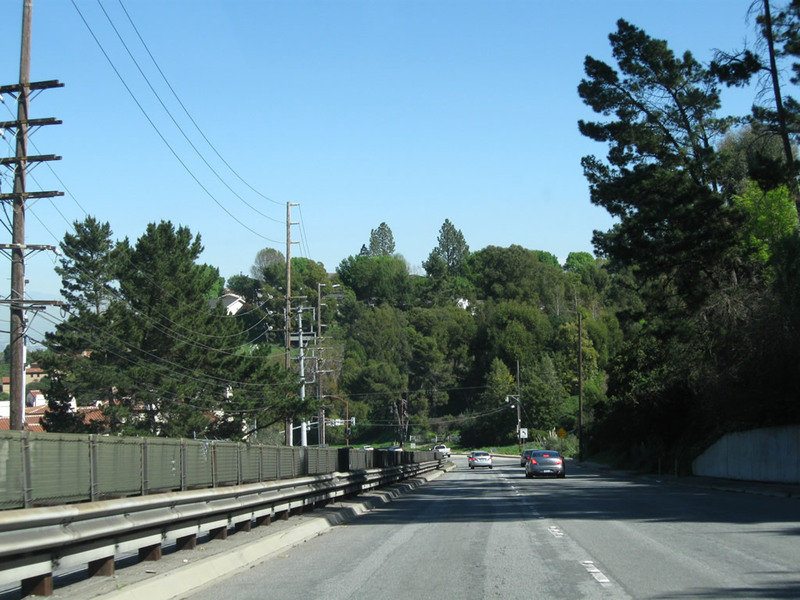 Photo taken 02/26/11. 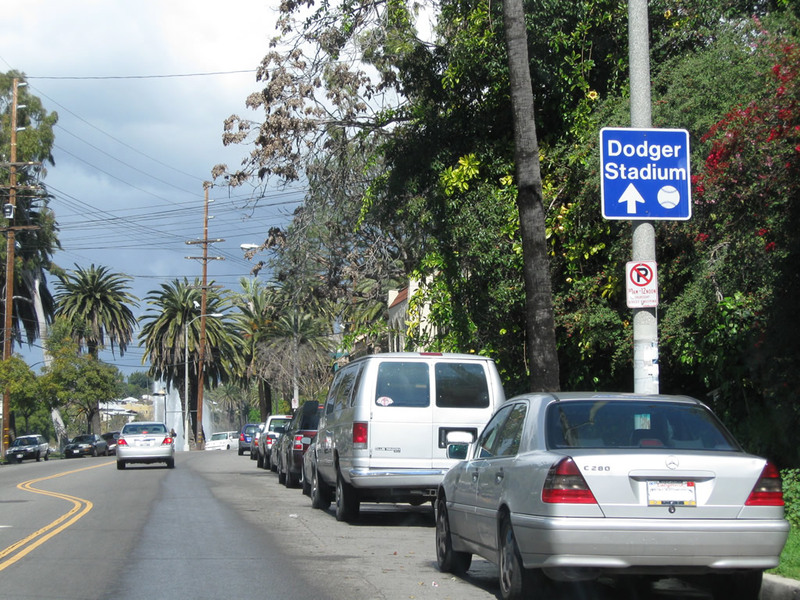 An older trailblazer for Dodgers Stadium is found a bit further north. 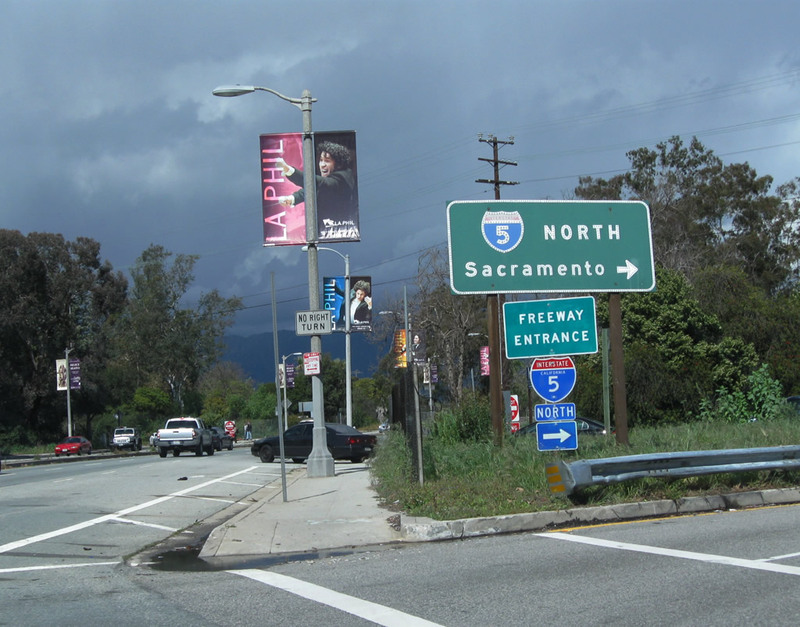 Photo taken 02/26/11. 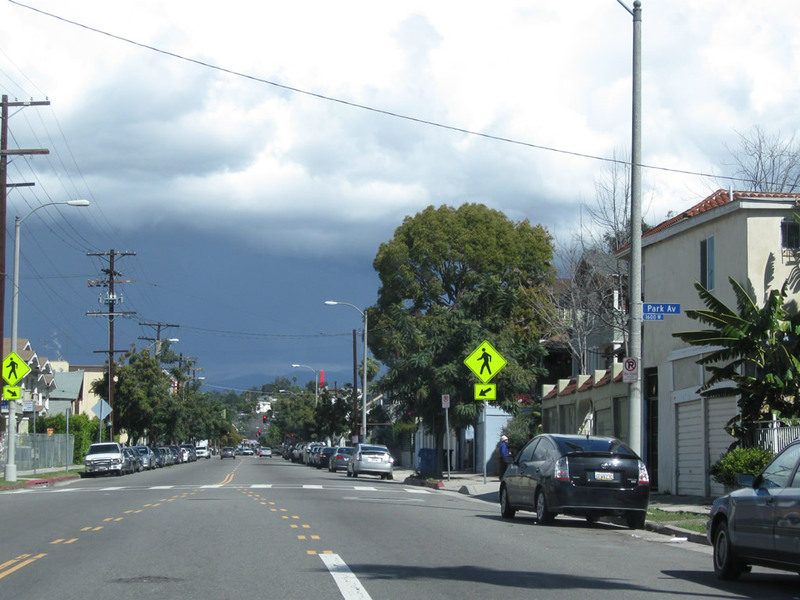 Northbound Echo Park Avenue meets Park Avenue. 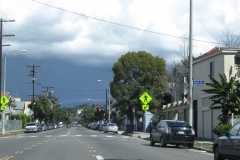 Photo taken 02/26/11. 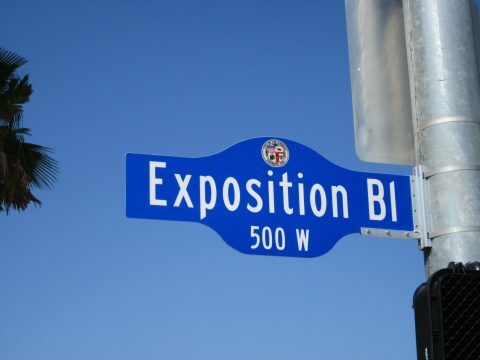 The Expo Line opened to transit use on April 28, 2012. 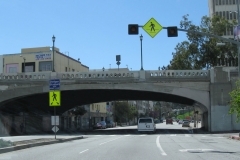 Part of the Metro rail network, the Expo Line begins in downtown Los Angeles and extends south along the Interstate 110 corridor to Exposition Boulevard, then turns west toward Culver City. 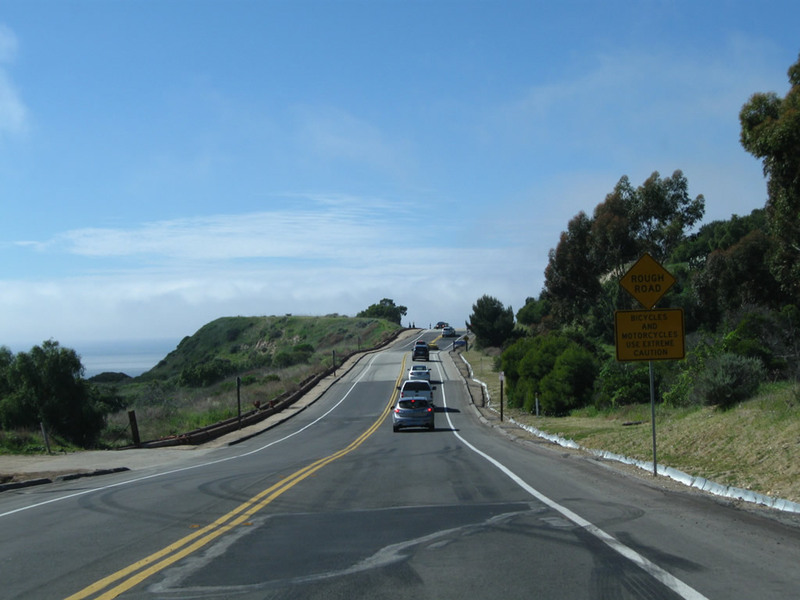 A future extension will eventually bring this line to Santa Monica. 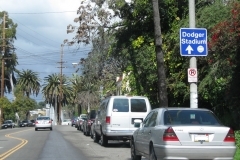 This series of pictures showcases Exposition Park, which is located south of the University of Southern California (USC) campus and includes the California Science Center, Sports Arena, and Los Angeles Coliseum. 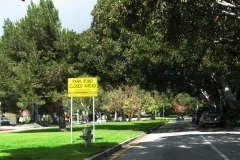 A sprawling rose garden sits near one of the main entrances into the Science Center just south of USC. Photos taken 05/05/12. 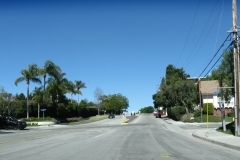 One of the steepest streets in Los Angeles is Fargo Street, which travels from Allesandro Street uphill to Alvarado Street. 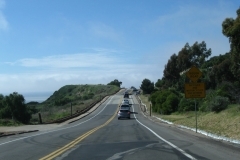 Walkers and bicyclists alike gather to climb this steep grade, measured at 32%. Photos taken 03/25/07. 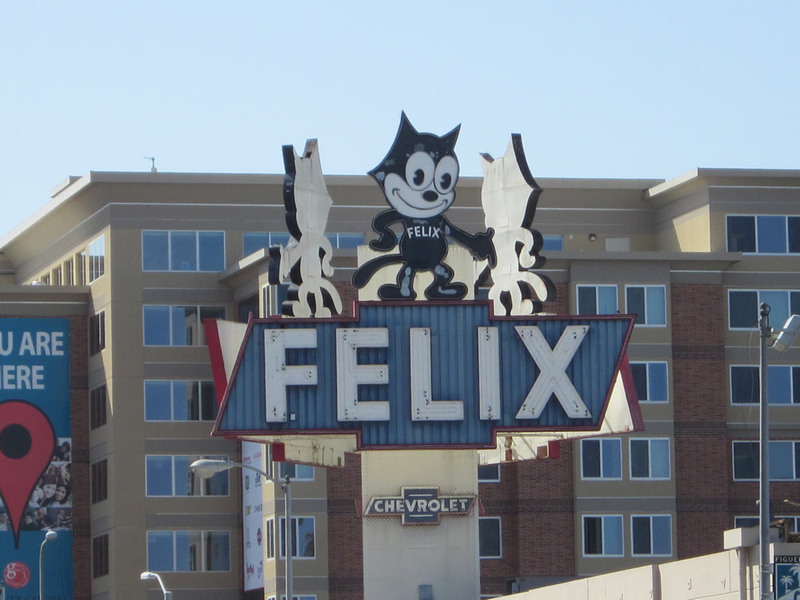 At the northeastern intersection of Figueroa Street (Old U.S. 6 and California 11) and Jefferson Avenue is Felix Chevrolet, which features Felix the Cat on its marquee. 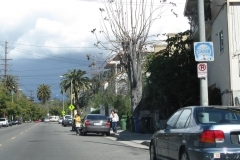 Photo taken 02/26/11. 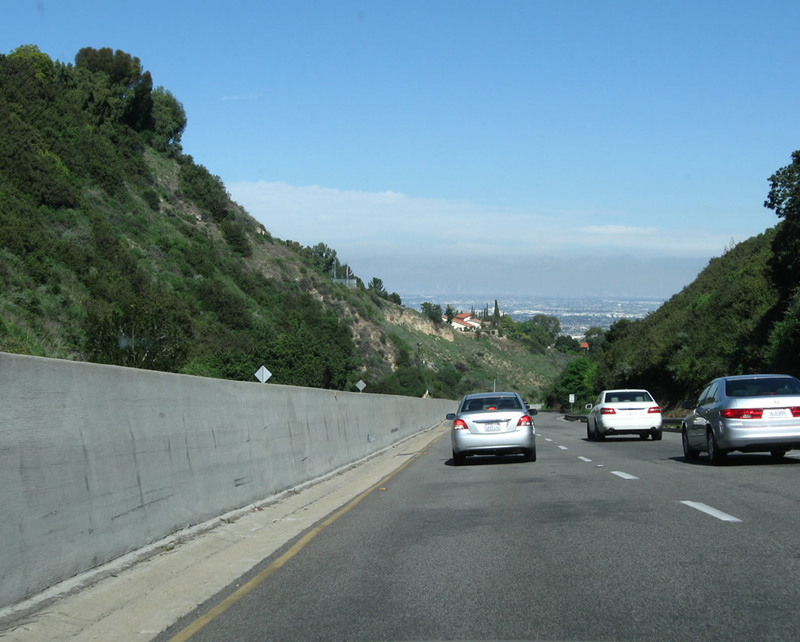 Southbound Glendale Boulevard approaches U.S. 101 (Hollywood Freeway). 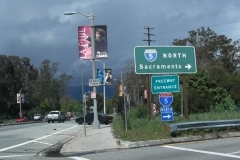 A graffiti-covered sign advises of the pending interchange. 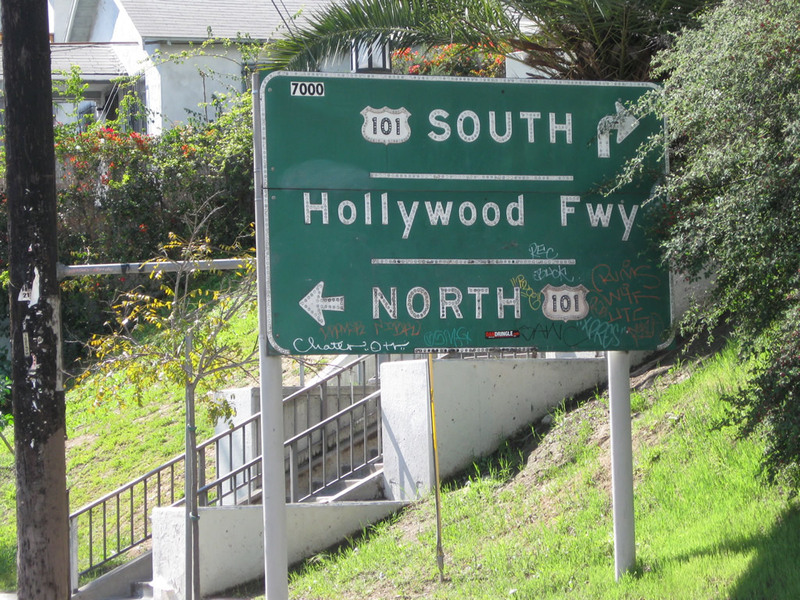 U.S. 101 travels north to Hollywood and south to Downtown Los Angeles. Photo taken 02/26/11. 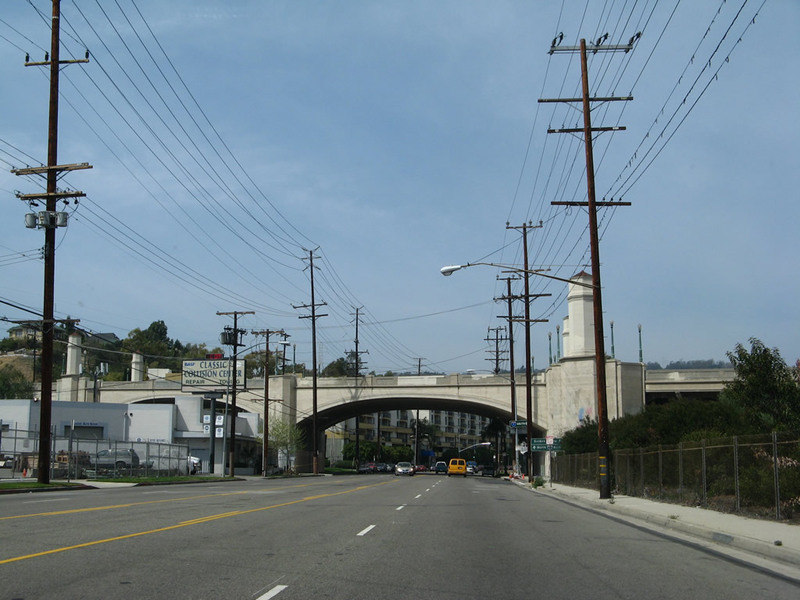 Leaving the Los Feliz district of Los Angeles near Griffith Park, eastbound Los Feliz Boulevard approaches Huxley Street followed by Riverside Drive and Interstate 5 (Golden State Freeway). A sign advises the best route to the Los Angeles Zoo and Botanical Gardens is via I-5 north. Photo taken 02/26/11. 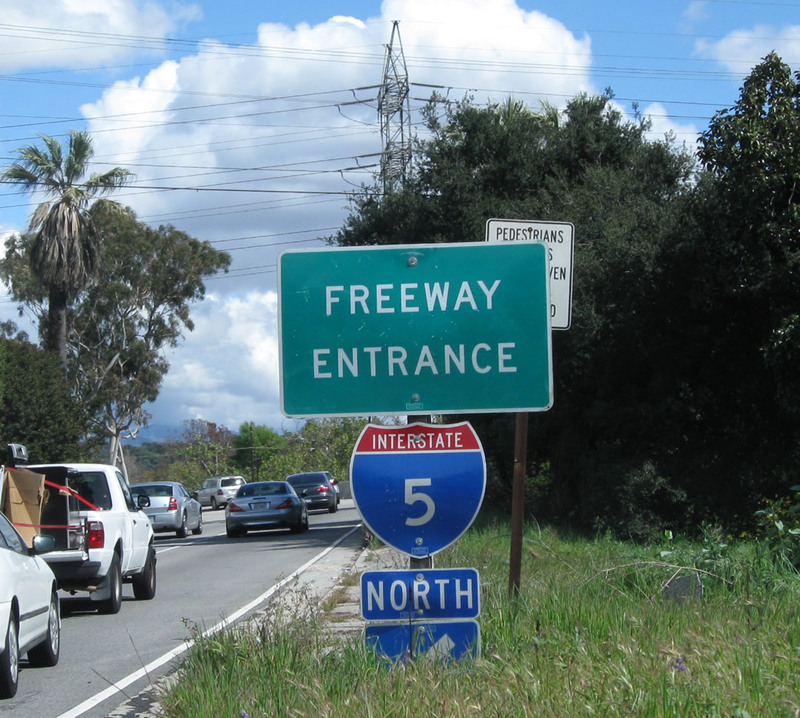 Overhead for I-5 posted ahead of the southbound ramp to East Los Angeles, Anaheim and Santa Ana. 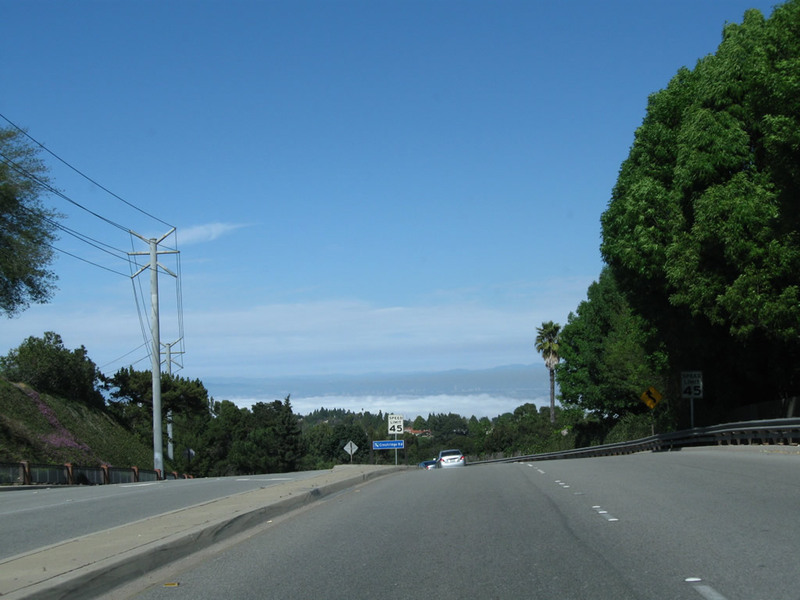 Photo taken 02/26/11. 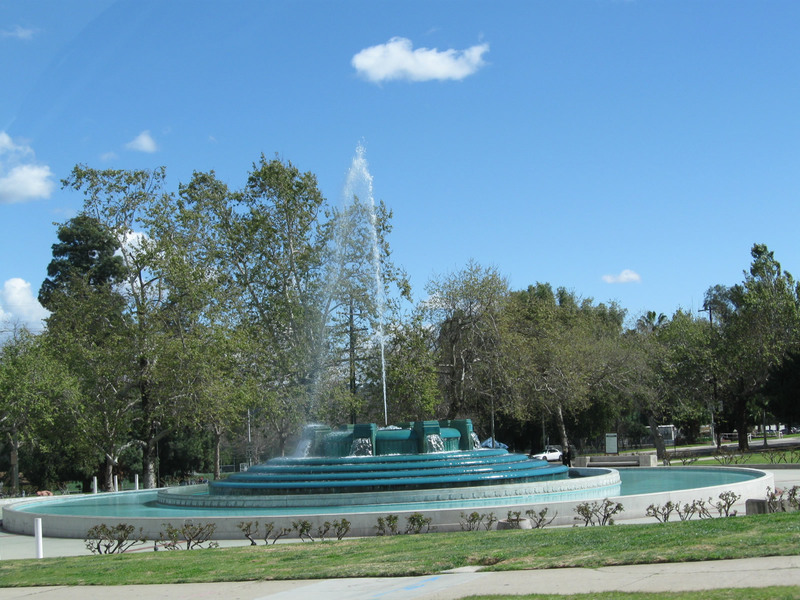 Eastbound Los Feliz Boulevard passes by the William Mulholland Memorial Fountain. Photo taken 02/26/11. 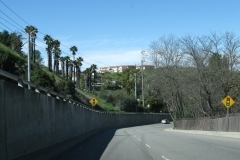 Riverside Drive south connects Los Feliz Boulevard with I-5 south. Photo taken 02/26/11. 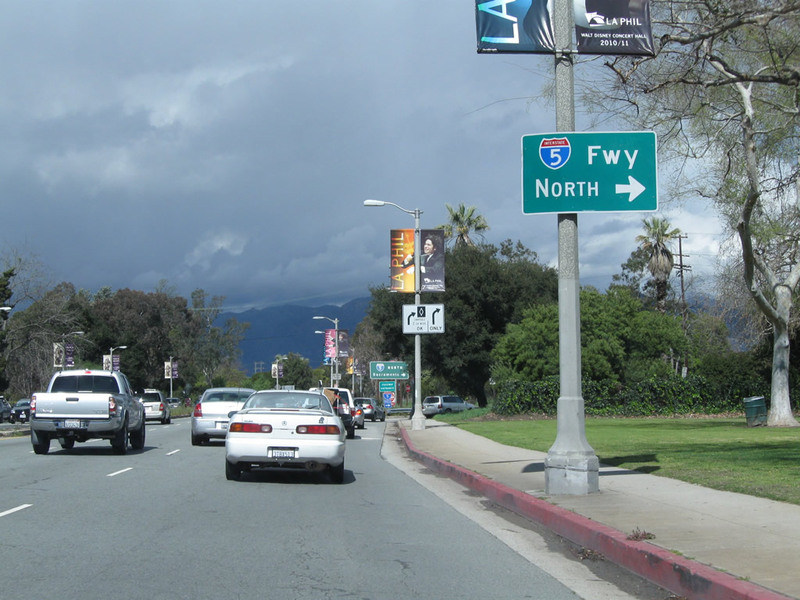 Los Feliz Boulevard east at the on-ramp for Interstate 5 north to Glendale, Burbank, and the San Fernando Valley. Photo taken 02/26/11. 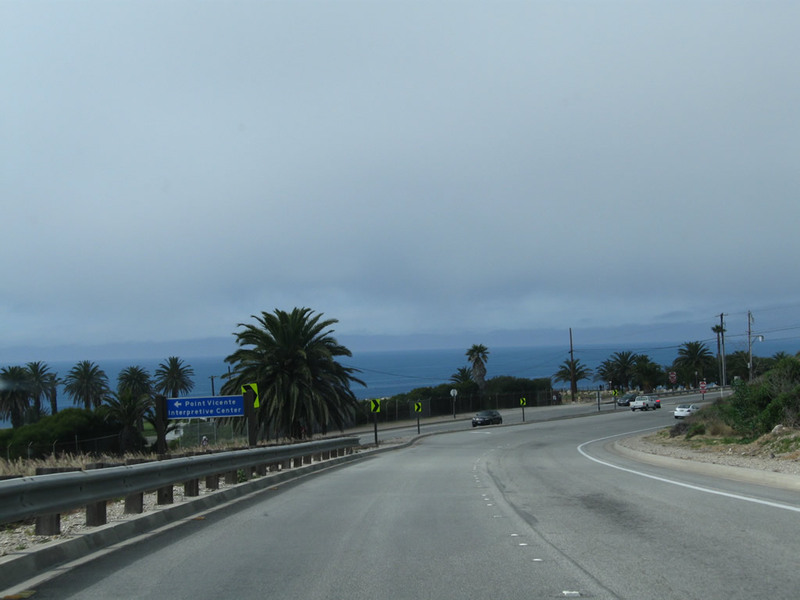 Passing from the city of Los Angeles into the city of Rancho Palos Verdes, westbound 25th Street changes into Palos Verdes Drive South. 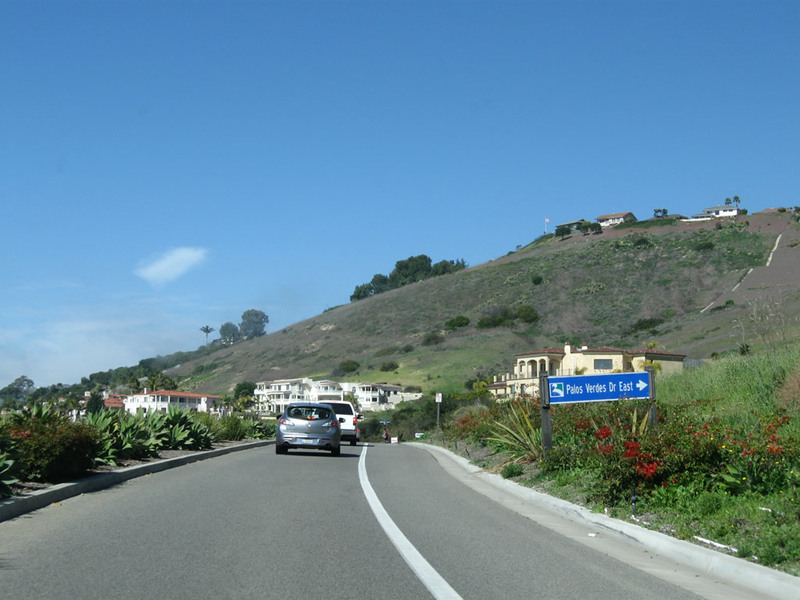 Palos Verdes Drive South follows the coastline as it skirts coastal bluffs and serves nearby residential development. 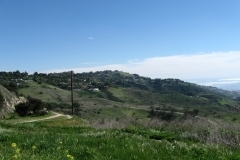 Photos taken 02/13/11. 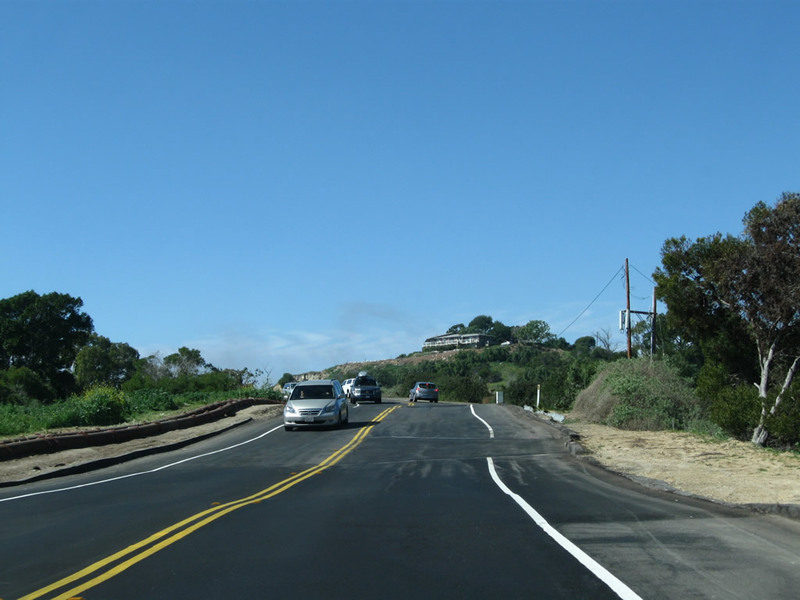 Westbound Palos Verdes Drive South approaches Palos Verdes Drive East. 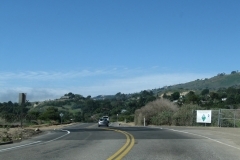 Photos taken 02/13/11. 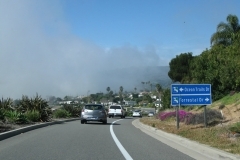 Coastal fog rolled into the area on this late morning in Rancho Palos Verdes. 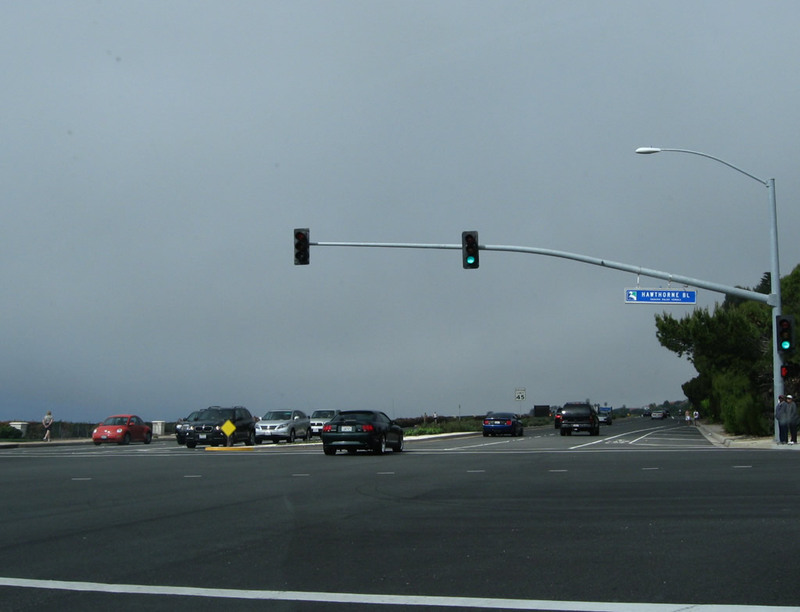 On the south side of the road is the championship Trump National Golf Course and its towering flagpole. 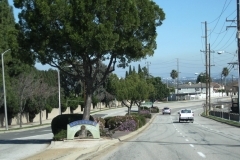 Photos taken 02/13/11. 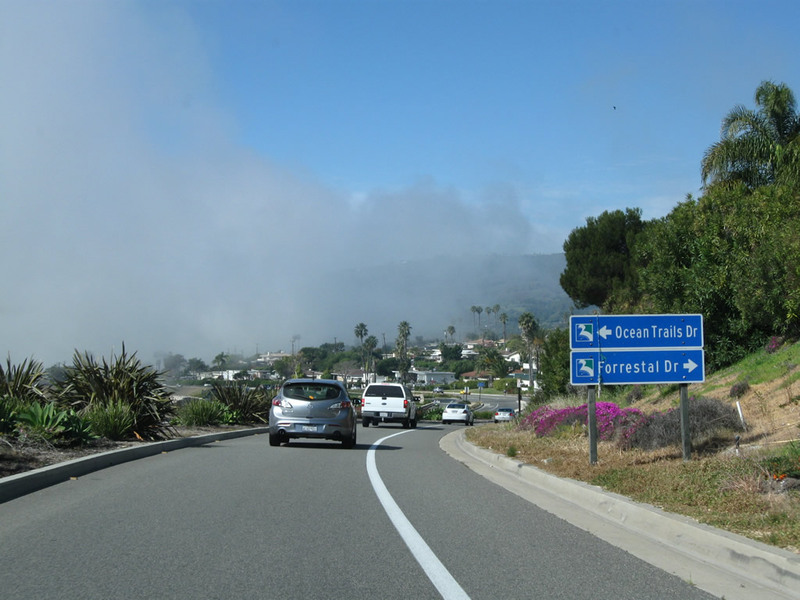 This section of Palos Verdes Drive South was impacted by a shifting coastal bluff. Land here is constantly in motion, resulting in the need for road repairs to keep it passable. 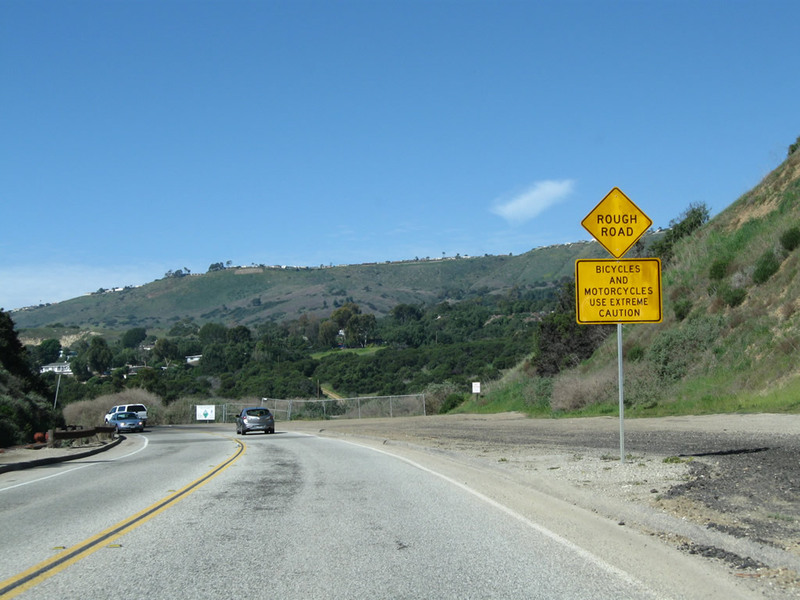 Large warning signs advise of the unstable ground for this nearly one-mile stretch. Photo taken 02/13/11. 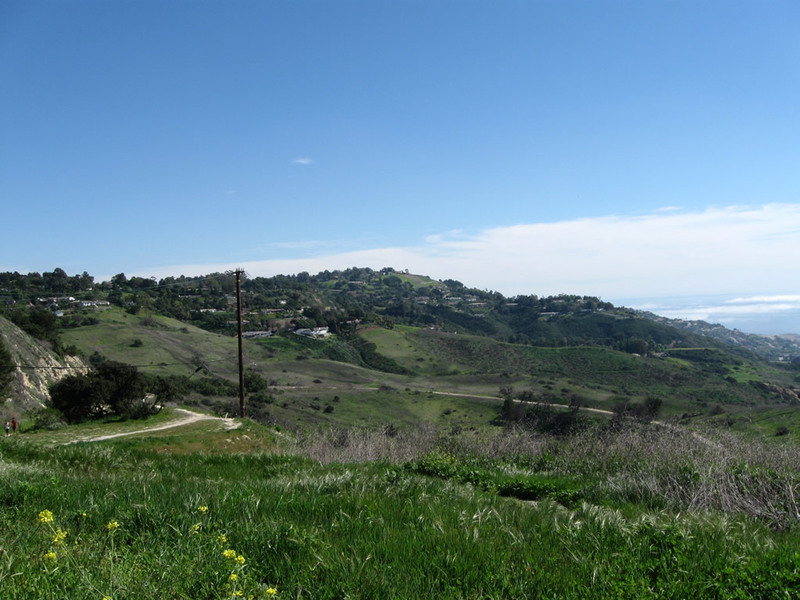 The area of the failing coastal bluff is preserved as open space (Palos Verdes Natural Preserve - Portuguese Bend Reserve). 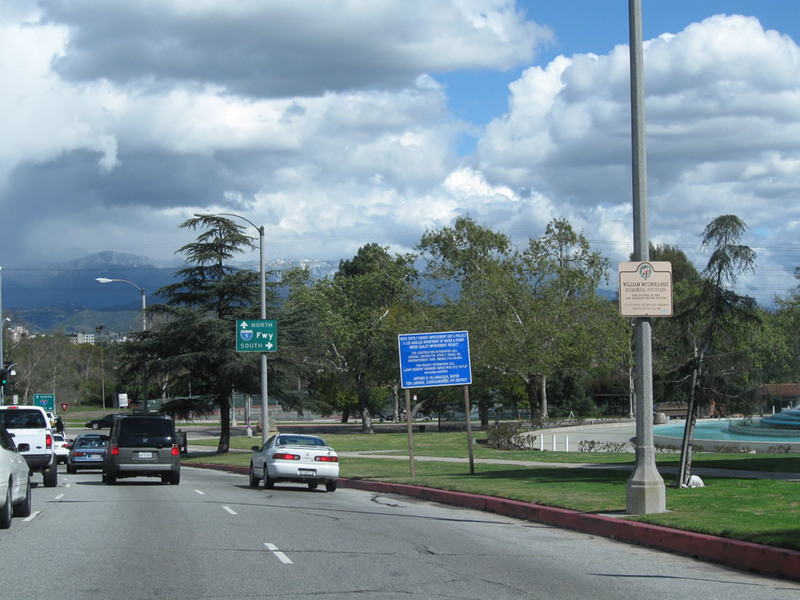 There were plans in the 1950s to extend Crenshaw Boulevard over the mountain and downhill to meet Palos Verdes Drive South, but the road was never built due to the instability of the terrain. 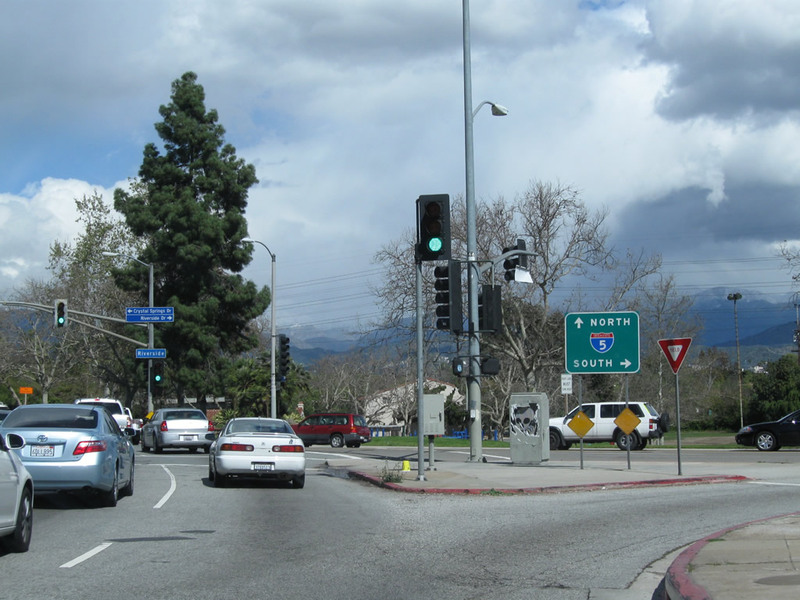 Photo taken 02/13/11. 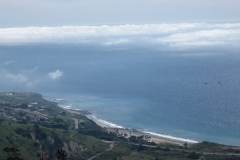 The area of the failing coastal bluff is preserved as open space (Palos Verdes Natural Preserve - Portuguese Bend Reserve). Photo taken 02/13/11. 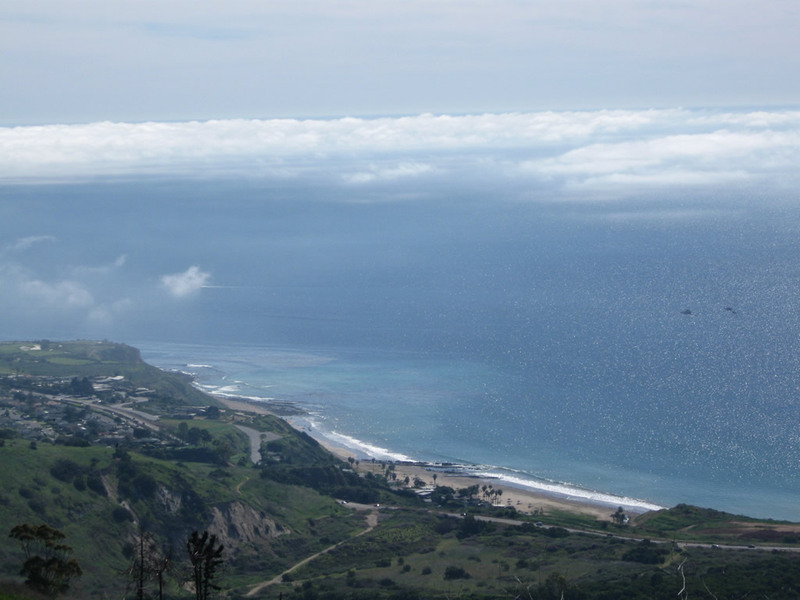 More of the unstable earth over which Palos Verdes Drive passes. Photo taken 02/13/11. 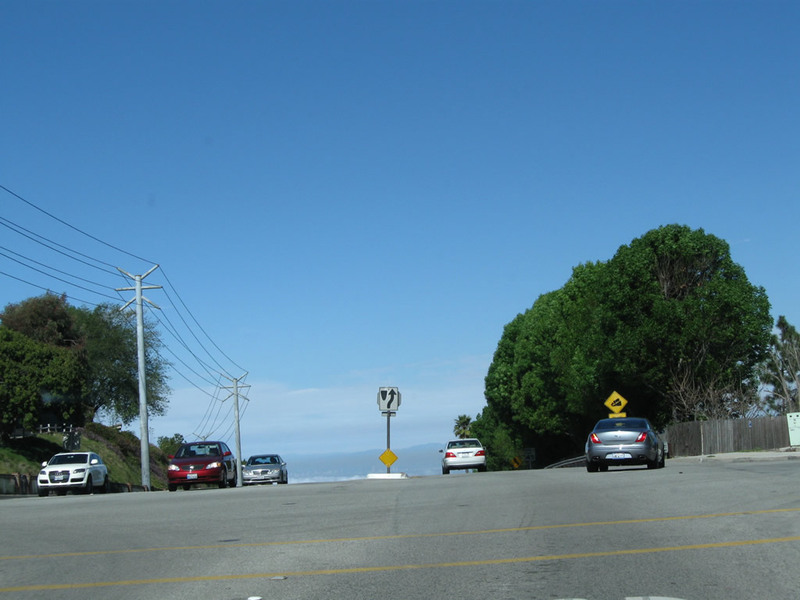 Northbound Palos Verdes Drive West meets CR N-7 (Hawthorne Boulevard). 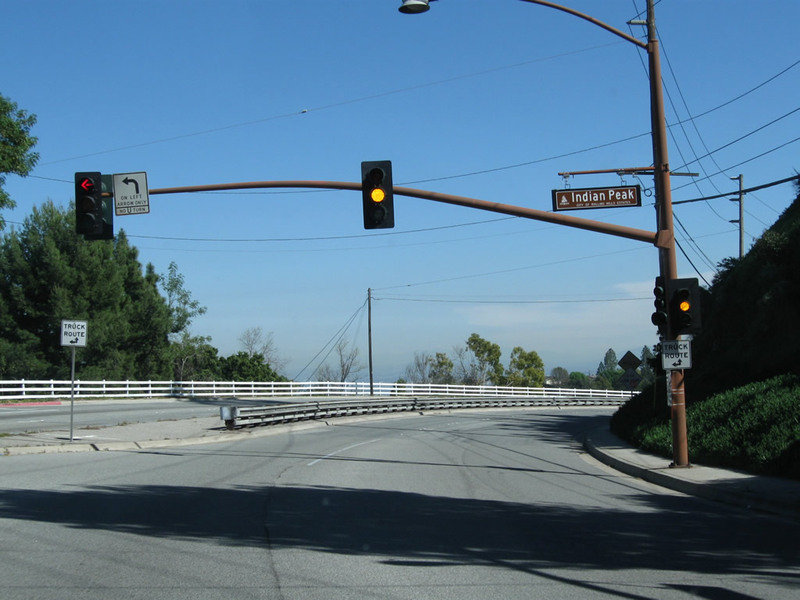 The signed county road begins at this intersection and climbs over the mountain before descending into Torrance. 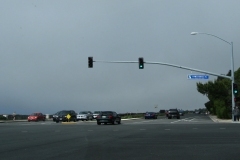 At the intersection with SR 1, Hawthorne Boulevard becomes SR 107. Photo taken 02/13/11. 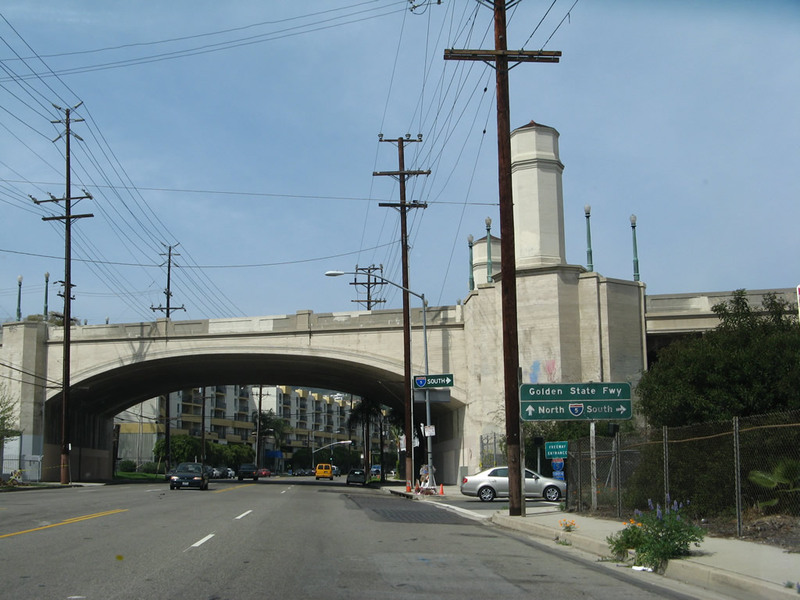 Riverside Drive approaches the arched Hyperion Avenue overpass. 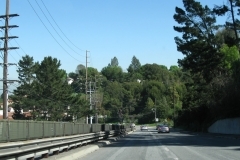 An on-ramp connects Riverside Drive to Interstate 5 (Golden State Freeway). 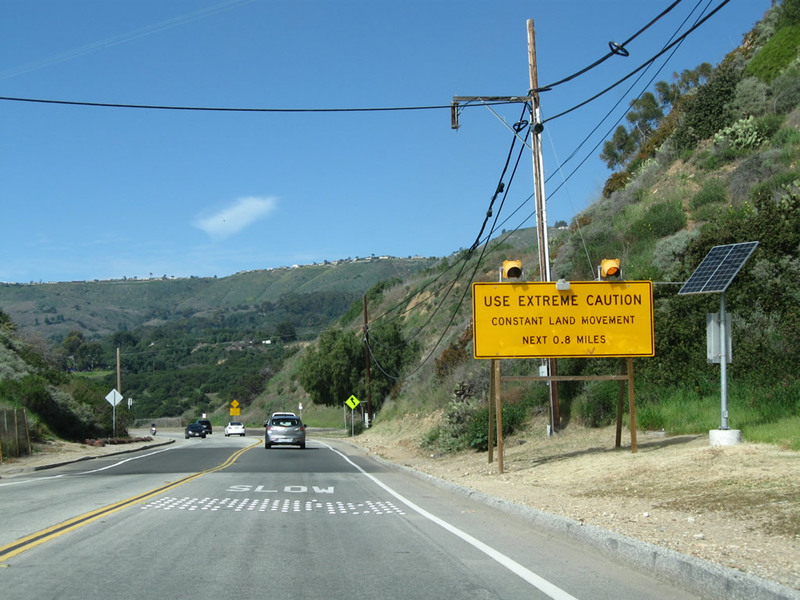 Photo taken 03/25/07. 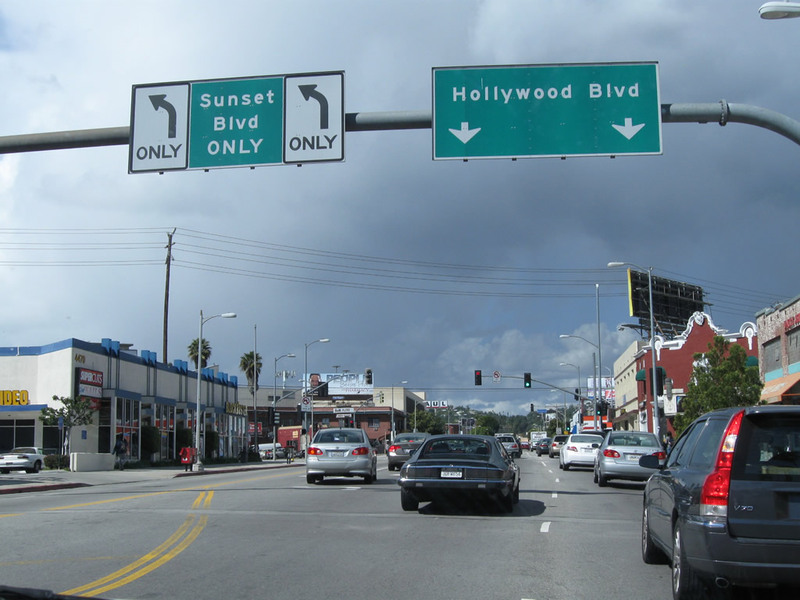 Sunset Boulevard splits with Hollywood Boulevard. Photo taken 02/26/11. 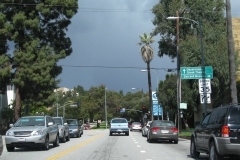 Northbound Vermont Avenue approaches Los Feliz Boulevard in the Los Feliz community of Los Angeles. 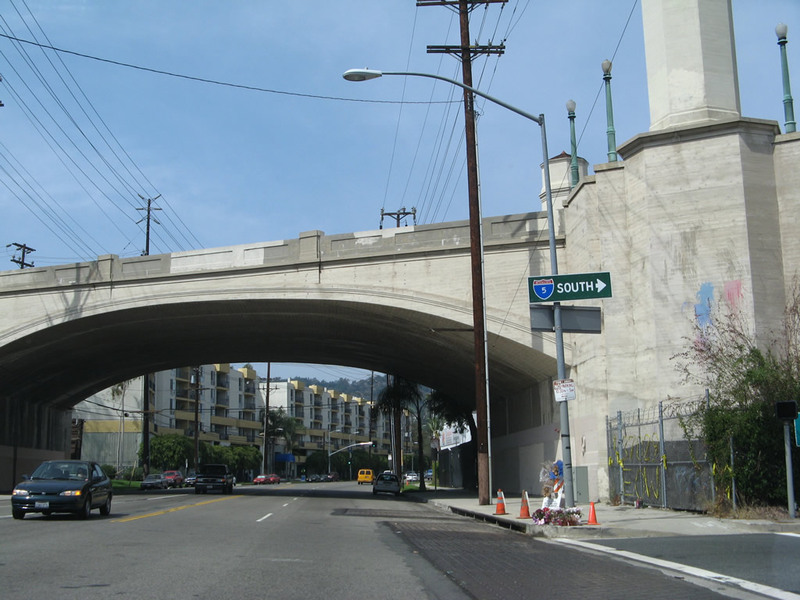 Photo taken 02/26/11. 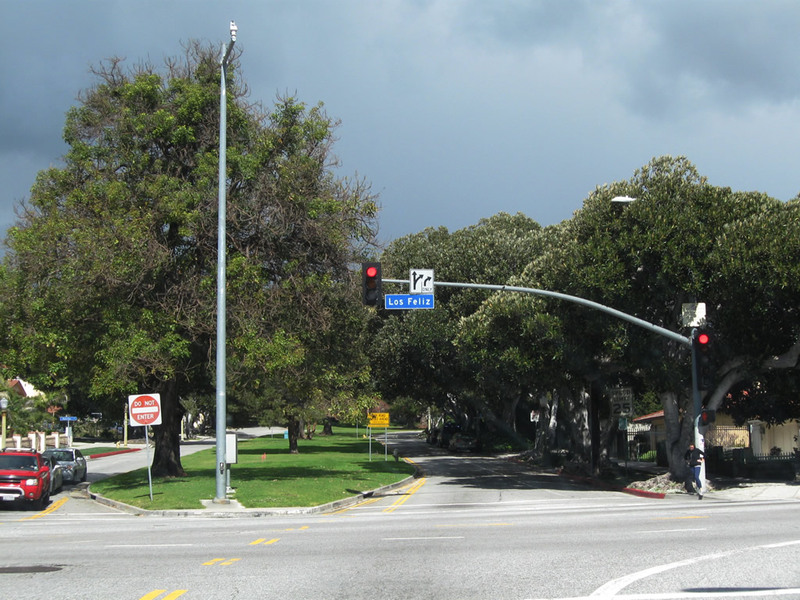 Vermont Avenue meets Los Feliz Boulevard at this signalized intersection. 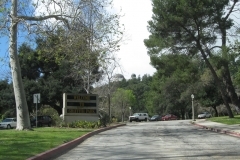 The street continues to Griffith Park, including the Greek Theatre, Roosevelt Municipal Golf Course and Griffith Observatory. Photo taken 02/26/11. 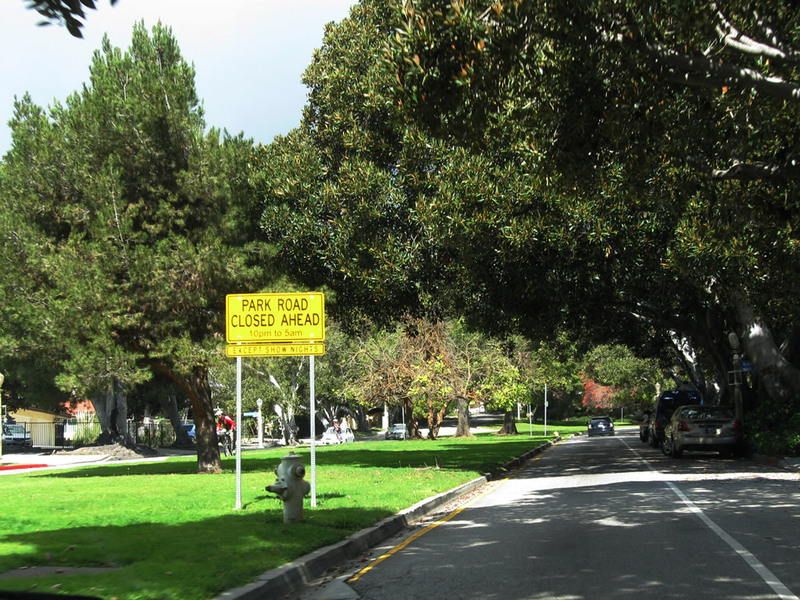 Through Griffith Park, Vermont Avenue is closed to through traffic overnight, except on show nights at the Greek Theatre. Photo taken 02/26/11. 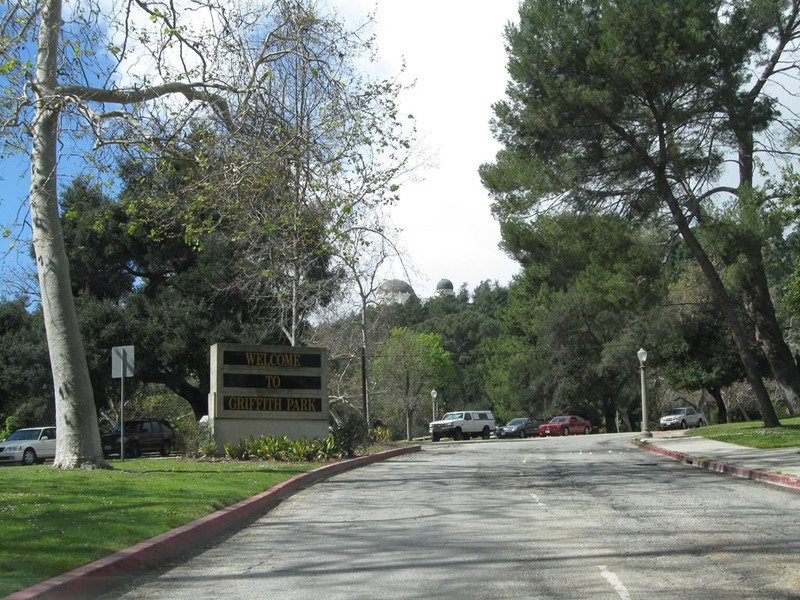 After passing by several homes, Vermont Avenue enters Griffith Park. 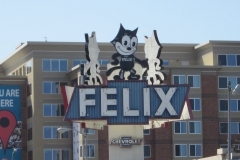 Photo taken 02/26/11. 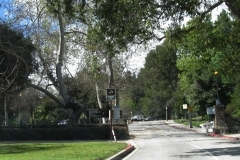 A monument sign welcomes visitors to Griffith Park. Photo taken 02/26/11. 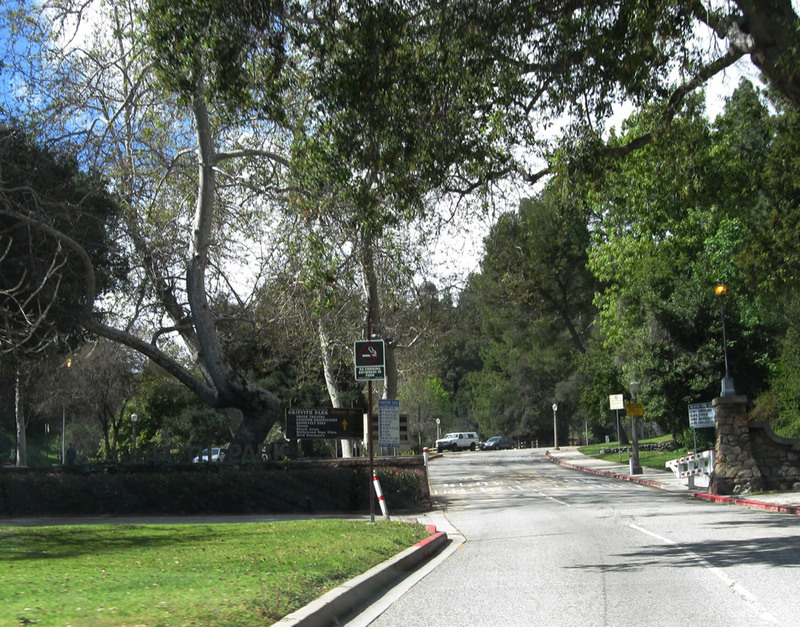 This series of pictures shows photos of Griffith Park in Los Angeles. 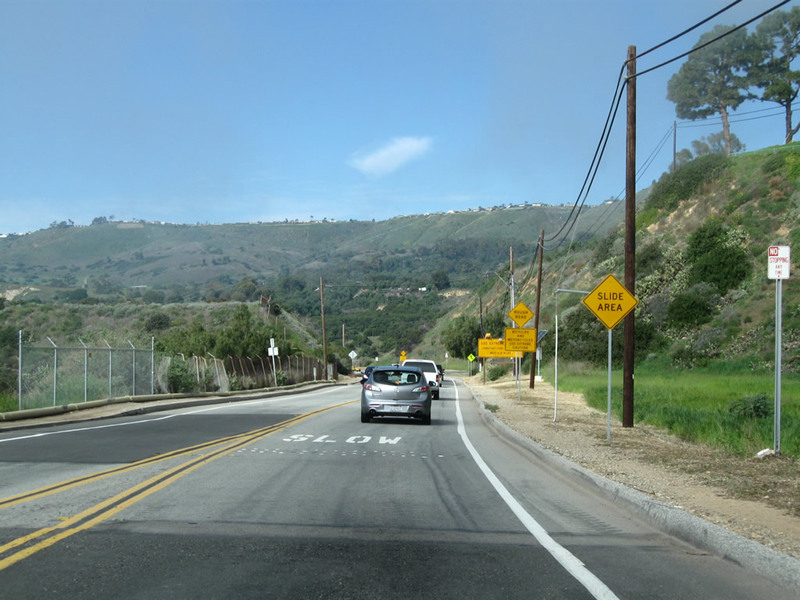 This first set follows Vermont Canyon Road north as it ascends toward the Griffith Observatory. 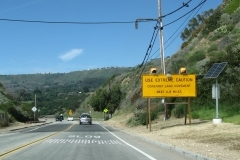 At the top of the grade, Vermont Canyon Road turns west to pass into a tunnel. Photos taken 02/26/11. 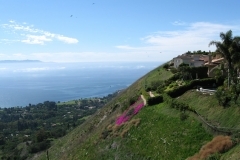 These views look out over Los Angeles from Griffith Observatory, starting with a view looking toward the north and then circling counterclockwise toward West Los Angeles and downtown. 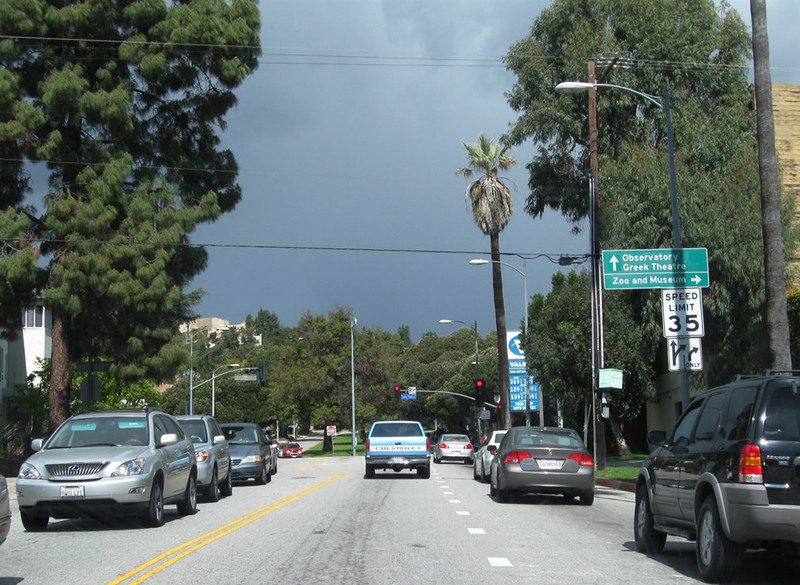 These pictures demonstrate the clarity commonly found after storms pass through the Southland. 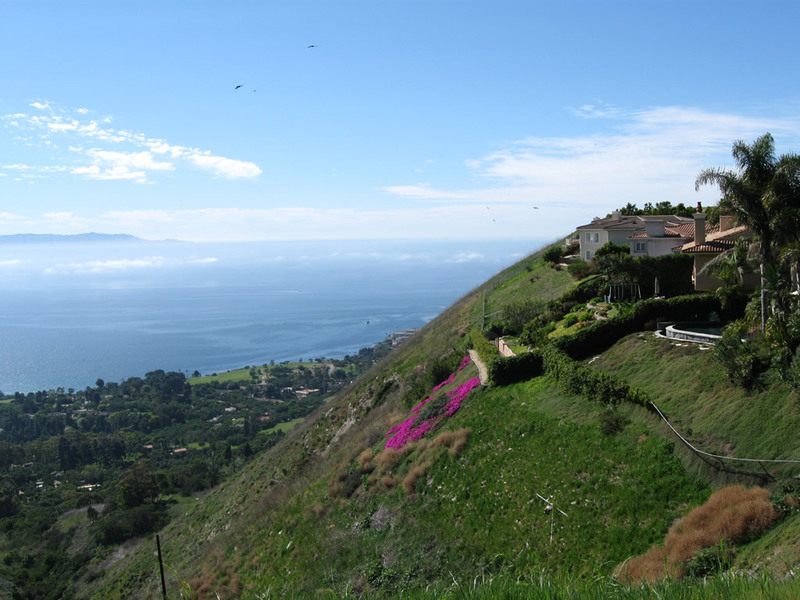 Included in the views is the Hollywood sign, visible on Mt. Lee. 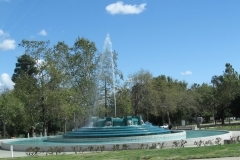 Photos taken 02/26/11. 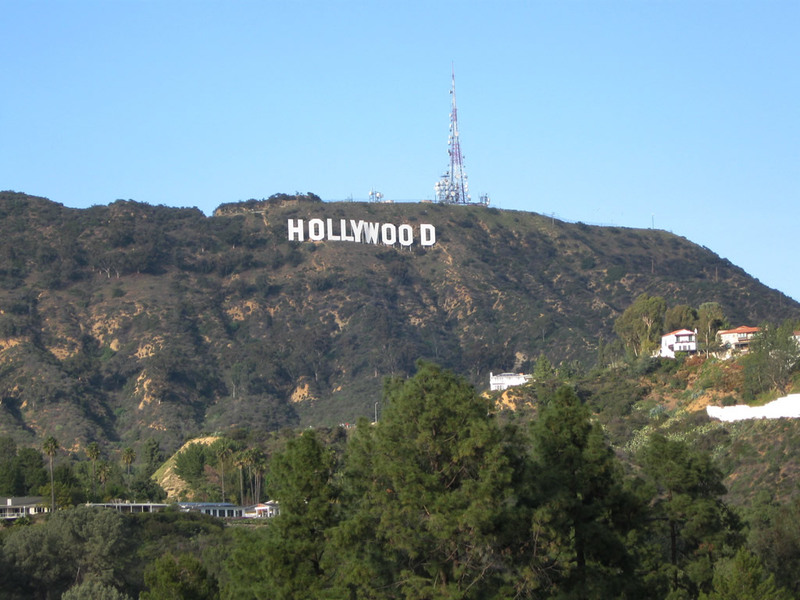 Griffith Observatory was dedicated on May 14, 1935 and is located on a promontory below Mount Hollywood overlooking the Los Angeles Basin to the south. 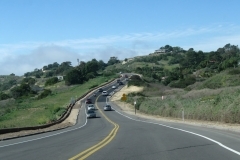 The observatory sits at 1,134 feet and contains telescopes and exhibits related to astronomy. 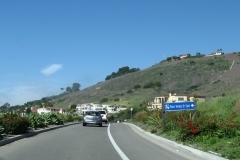 Photos taken 02/26/11. “Expo Line&apos;s opening day finally set: Phase one of Los Angeles’ much-delayed and ever-costlier first line into the Westside in 50 years is set to open April 28. 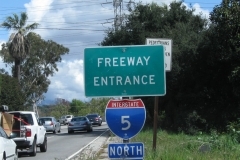 Most of it, anyway.” Los Angeles Times, March 24, 2012. Page Updated March 7, 2011.